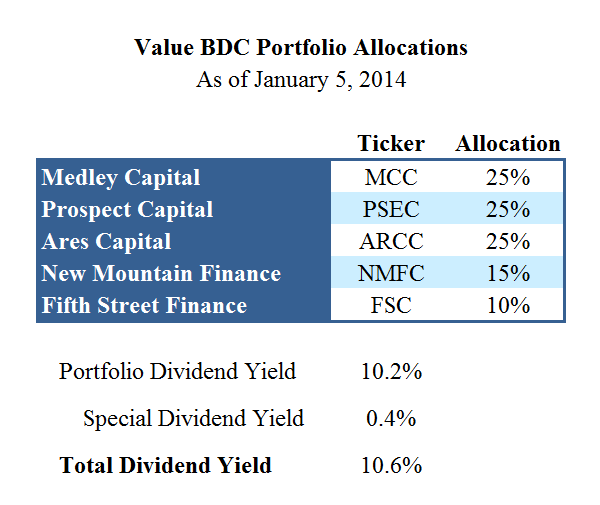 This article is a follow up to "The Value BDC Portfolio: Q3 2013" with updated allocations and investments for a BDC portfolio with an annual dividend yield of 10.2% plus the potential for special dividends and capital gains from being relatively undervalued compared to other BDC investments. The BDC sector can be volatile but this portfolio attempts to find undervalued investments and currently, the top five investments for a value BDC mix are Medley Capital (NYSE:MCC), Prospect Capital (NASDAQ:PSEC), Ares Capital (NASDAQ:ARCC), New Mountain Finance (NYSE:NMFC) and Fifth Street Finance (FSC). 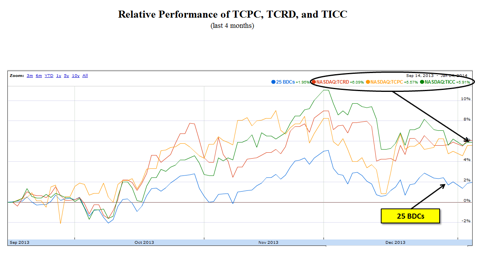 Last quarter this portfolio contained TCP Capital (NASDAQ:TCPC), THL Credit (NASDAQ:TCRD) and TICC Capital (TICC), all of which have all performed better than the average BDC over the last quarter as shown in the chart below and are now not as undervalued as other BDCs. This is a good thing and as discussed in previous articles this portfolio will most likely require quarterly changes. This portfolio is for investors who want to participate in capital gains from undervalued BDCs and will most likely have the highest turnover needing more attention than the other portfolio types. 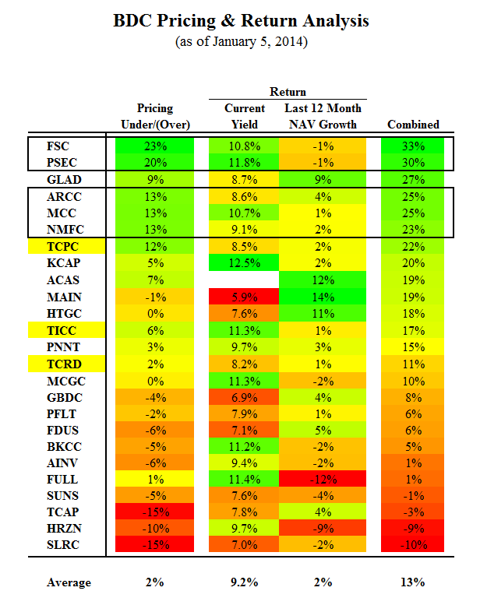 This is for investors looking for capital appreciation in the long and short term, while willing to take on a little more risk and most likely these BDCs will have higher yields. I consider many things when assessing valuation levels, including net asset value ("NAV") and EPS multiples as well as growth rates and projected earnings. I also take into account the risk ranking, and I believe there is a strong correlation between investors' perception of risk and the valuation multiples they pay. 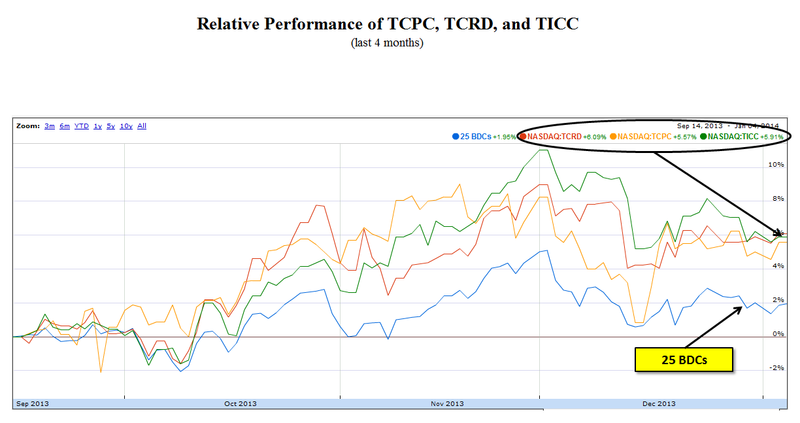 I use 'total return' to evaluate performance, taking into account dividend yield plus long-term capital appreciation. NAV growth per share (or at least NAV stability) is an important indicator for many reasons, including the demonstration of growth or preservation of investors' capital through appreciation of assets and/or the reduction of liabilities. BDCs are usually priced based on NAV multiples, so a growing NAV per share usually leads to incremental capital gains for investors. The following allocations for the value BDC portfolio are used for the remainder of the information in this article, and all metrics are weighted accordingly. 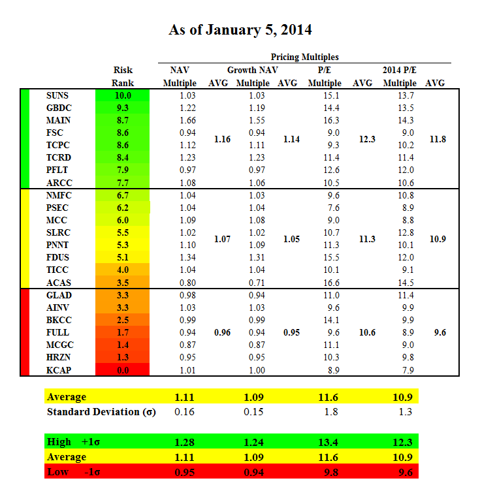 These are the five general criteria I use to evaluate BDCs followed by my most recent BDC ranking table. 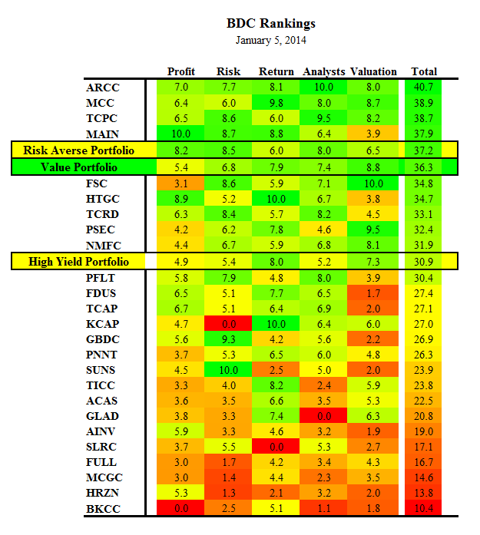 I have included the Value, Risk Averse and High-Yield portfolios as a group in the table indicating how a portfolio with my recommended weighting would compare to the other BDCs. As you can see the value portfolio has a higher ranking for the valuation and return compared to the average BDC. When evaluating BDCs, it is important to understand if the dividends are sustainable, ideally through net investment income ("NII") and special dividends covered by spillover taxable income or realized capital gains. The table below shows projected EPS and the current dividend for the calendar Q4 2013 for each BDC, with my personal projections for MCC, PSEC, ARCC and FSC. In Q4 only FSC might fall short of covering dividends due to the timing of new originations but by calendar Q1 2014 it should be able to cover using moderate amounts of leverage with much safer than average investments as discussed in "FSC: Time to Buy or to Sell?". This is most likely why FSC is one of the most undervalued BDCs at this point and I believe after it reports results over the coming quarters its pricing will return which is why it is only 10% of this portfolio and I will adjust based on Q4 results. PSEC has lumpy income and a reserve of undistributed NII to sustain dividends for at least a couple years as discussed in "PSEC: Sustainable High-Yields?". ARCC is the most likely of the group to grow its dividends in the coming quarters as shown in "ARCC: December 2013 Report" and MCC also has the ability to pay more in late 2014 as discussed in "MCC: Projections, Returns, Pricing and Recommendations". 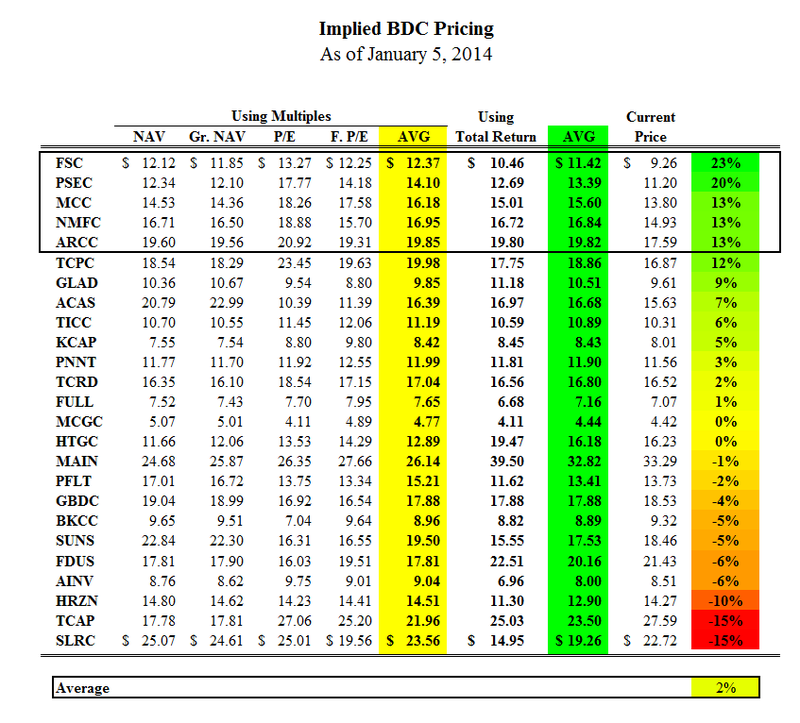 In a series of articles, I took an in-depth look at the relative risk levels of each BDC. Specifically, I looked at portfolio credit quality, investment asset classes, diversification, non-accrual rates, portfolio yield, leverage, interest rate sensitivity, volatility ratios, market capitalization, insider ownership and trends, institutional ownership and trends, and management/operational history for each BDC. The weighted average rank of this portfolio is 6.8 (a rank of 10 implies the least amount of risk). The goal of this portfolio is to provide higher returns through capital gains from being undervalued as well as higher than average yields that combined will return more to investors over the coming quarters. I use two different approaches to pricing including the standard multiples of NAV and EPS along with total return and risk adjusted expected yields. Ideally, each BDC would be priced along a valuation curve with investors paying a premium for favorable risk-to-reward ratios. 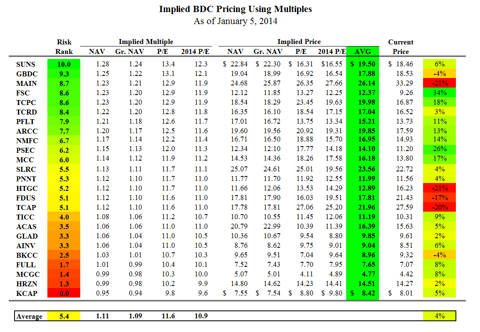 Below is a table using my relative risk ranking to categorize each BDC into valuation levels and appropriate multiples of NAV, LTM EPS and 2014 EPS. 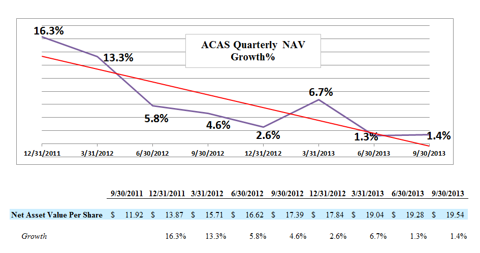 I have also included a "Growth NAV" multiple that takes into account expected NAV per share growth based on the last 12 months. 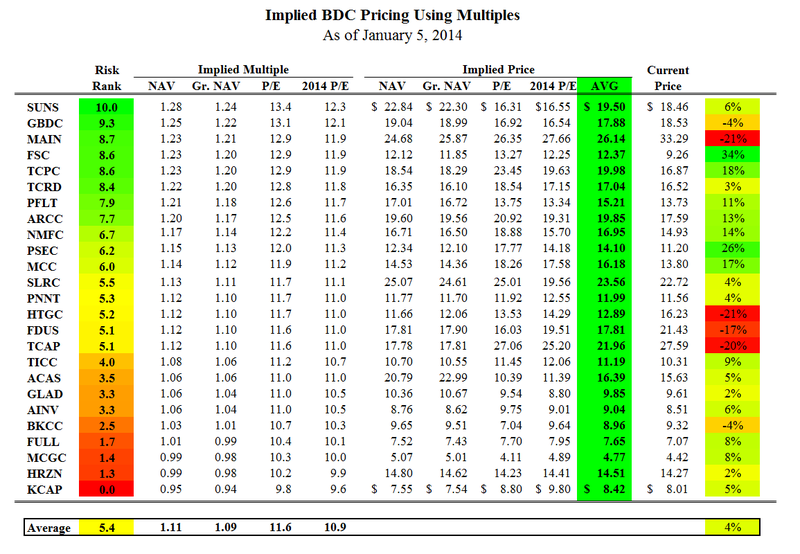 Using multiples only implies that 14 of the 25 BDCs (or 56%) are within 10% of being priced correctly but four BDCs (MAIN, HTGC, FDUS, and TCAP) seem to be overpriced (almost 20% higher) using multiples and all of which have much higher NAV per share growth which is why I also use total return to assess valuations. I will not get into the detail regarding my total return valuation methodology in this article but the detail is available in "Total Return Pricing For BDCs". The table below uses an average of the two methods and compares it to the actual price for each. 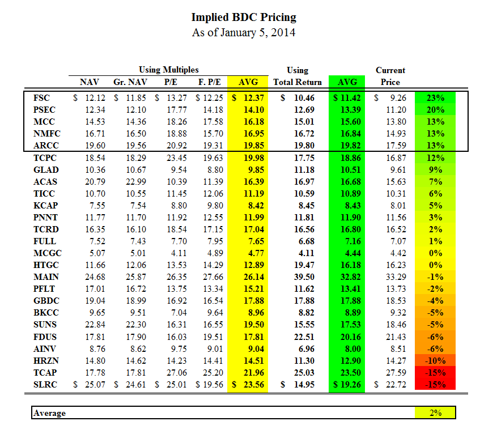 As you can see the BDCs in this portfolio are the top five undervalued BDCs. However this does not take into account dividend yield and NAV per share growth and/or stability which are both included in the table below. This portfolio might require a higher amount of turnover and reinvestment as prices change relative to each other, and as interest rates rise many of these investors will sell baskets of high yielding stocks regardless of the underlying fundamentals. This should be seen as an opportunity to buy for the long term. In my weekly newsletter I track the performance of the 25 BDCs that I follow and currently they are trending higher as shown in the chart below. Disclosure: I am long MAIN, TCPC, ARCC, FDUS, TCRD, PSEC, NMFC. I wrote this article myself, and it expresses my own opinions. I am not receiving compensation for it (other than from Seeking Alpha). I have no business relationship with any company whose stock is mentioned in this article.